The Information and Knowledge Management Society is a professional society based in Singapore. We publish the Journal of Information and Knowledge Management through World Scientific, hold regular networking events, support research into information and knowledge management, and organize workshops and conferences. Contributed articles are welcome, and if selected for publication, will be subject to editing. The views expressed by contributors are their own and may not necessarily be those of the publisher. The New Zealand Knowledge Management Network is an informal, non-profit community of practice. It aims to provide opportunities for professionals from different industries to share their interest, knowledge and experiences in Knowledge Management. We hold regular members’ meetings and produce bi-monthly articles, interviews and case studies about KM. The Information and Knowledge Management Society is a professional society based in Singapore. Founded in 2001, it publishes the Journal of Information and Knowledge Management through World Scientific, holds regular networking events, supports research into information and knowledge management, and organizes workshops and conferences. One of the most vibrant and active KM discussion forums around, with its own website, but with most activity taking place via a Yahoo Groups discussion forum. Originally founded in 1998 in Australian Capital Territory, with a strong focus on public sector KM, it has since grown to international dimensions. Gurus lurk in the shadows and occasionally emerge to do battle. This association, formed in 2001/2 and spearheaded by the KM practitioners at Malaysia's Multimedia Development Corporation, holds monthly talks, a national KM conference, and is actively pursuing a certification programme in KM. This site is in Croatian, but the Society is very active. It is co-organiser with Croatia's National and University Library for CROinfo 2004, a major KM conference held in May 2004. US-based society which establishes local chapters in different countries, often arising out of their CKM (Certified Knowledge Manager) workshop. Founded in 2003 as a membership organization for London-based practitioners and researchers in knowledge management. Founded as the Arab Management Society in 1990, changed its name to Arab Knowledge Management Society to reflect the growing importance of a knowledge-based society. A new society, with its first conference in November 2003. Founded in 1998, probably the most mature KM society in Asia. Has a number of study and practice committees. Sister society of iKMS, founded as a society in 2001. Runs an annual Asia Pacific KM Conference. A bi-monthly online newsletter from the Information and Knowledge Management Society. A weblog intended to promote knowledge sharing and collaboration between non-commercial KM Societies, Institutes and informal forums. Articles and resources on KM, elearning and innovation. A feast of resources on KM, including one of the more comprehensive and up to date conference and workshop listings covering the world. Knowledge management thinking for the practitioner! This issue we look at the challenges faced by SMEs in Singapore and how KM can address some of their needs. SMEs form a significant part of Singapore's economic landscape. There are 92,000 SMEs in Singapore. Collectively, they make up 92% of all establishments, and employ 53% of the workforce. Many MNCs today were SMEs of yesteryear e.g. Yahoo, eBay, Google ... SMEs are the incubators of future economic giants. The truth is, SMEs face a number of challenges in doing business. For example, it is difficult for them to reach out to new customers and new markets because of the high cost of advertising and business promotion. They are also constrained by their physical size. Being small and unknown, they may not be able to secure the trust and confidence from potential customers. The good news is that the rapid explosion of the Internet is driving dramatic changes in the way businesses operate and compete. It is causing a fundamental shift in the way businesses are conducted, and the rules of competition are being redefined in the knowledge economy. 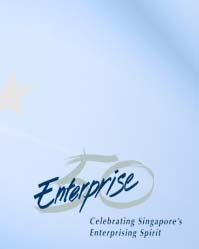 Singapore has a list of Enterprise 50 companies which are ranked based on the following set of key performance indicators: operating profit before tax; turnover; growth in operating profits; growth in turnover; return on total fixed assets; operating profit per employee; percentage of turnover from overseas operations; percentage of payroll spent on training and percentage of revenue invested in research and development (R&D). It is insteresting to note that knowledge management is one of the qualitative factors taken into consideration besides management philosophy, innovation and market presence. Take our industrial policy. At the beginning, it was the right thing for us to attract multinationals to Singapore. For some years now, I've been trying to tell everybody: 'Look, for God's sake, grow our own timber.' If we really want knowledge to be rooted in Singaporeans and based in Singapore, we have to support our SMEs. I'm not a supporter of SMEs just for the sake of more SMEs but we must grow our own roots. Creative Technology's Sim Wong Hoo is one and Hyflux's Olivia Lum is another but that's too few. We have been flying on auto-pilot for too long. The MNCs have contributed a lot to Singapore but they are totally unsentimental people. The moment you're uncompetitive, they just relocate. Knowledge Management, the leveraging of knowledge within an organisation to add value to the business, is going to be key for SMEs in order for them to break free from the limitations of physical size and limited resources. SMEs share many knolwedge management requirements of larger enterprises but are constrained by their tigher budgets. Knowledge Management (KM), the leveraging of knowledge within an organisation to add value to the business, is going to be key for SMEs in order for them to break free from the limitations of physical size and limited resources. Angie Ang, Assistant Manager, Knowledge Management at Jurong Consultants Pte Ltd has kindly agreed to share some of the KM initiatives at her company. Currently an assistant professor with the Nanyang Business School at the NTU, Dr. Bruno Trezzini still finds time to pull together this year's International Conference on KM as the Conference Liaison for iKMS. iKMS approached Siemens, one of its corporate members to find out more about the positive and negative experiences they might have come across in the process of implementing KM in small and medium enterprises. Here are the insights William Teo from Siemens was so kind to share. Weblogs. They are everywhere. This humble publishing technology is proving to be the silent killer application of this decade. In this article I’ll define what weblogs are and explore the malleable attributes that make them so remarkably flexible under various contexts. While not busy with iKMS affairs as Honorary Secretary, Vijaya works as an Acquisitions Librarian at NTU. Over the past decade or so significant restructuring efforts have resulted in organizations with fewer hierarchical levels and more permeable functional and organizational boundaries. While hopefully promoting efficiency and flexibility, a byproduct of these restructuring efforts is that coordination and work increasingly occur through informal networks of relationships rather than through formal reporting structures or prescribed work processes. These seemingly invisible webs have become central to performance and strategy execution. Research shows that appropriate connectivity in networks within organizations can have a substantial impact on performance, learning, and innovation, and benefits also accrue from well-connected networks between organizations. Christian Chao is a PhD candidate in the field of Technology and Enterprise Managment at Nanyang Technological University. He currently serves as an Executive Committee Member of the 'Innovators and Entrepreneurs Association' (aka IdEA), as well as Tung Ling Community Services. He is also a member of Singapore's Economic Development Board (EDB) Society. To address this, the first part of the book (Chapters 1-4) suggests that there exist certain organisational defenses which discourage learning, leading to mediocre organisational performance. The second part of the book (Chapters 5-9) then proposes how to overcome these defenses. A Career in Knowledge Management? iKMS's events page lists local KM events in Singapore, but also major Asian and international KM conferences. A self-moderating global community thinking and collaborating on subjects around (but not limited to) Knowledge Management and Innovation in the worlds of business and academia. David Gurteen keeps a very current listing of KM events - both conferences and workshops. He is very well networked into European events especially, and often gives a brief overview of the event, who it's pitched at, and what you can expect to gain from it. Peck Khay on A Career in Knowledge Management?